(CelebrityAccess MediaWIre) — The city of Anaheim, California, and the Anschutz Entertainment Group have tentatively agreed to a five-year promoter deal that would bring 50 concerts, family shows and sporting events annually to the 7,500-seat Anaheim Arena. Greg Smith, the convention, sports and entertainment director at Anaheim, told the Los Angeles Times that AEG Live would have exclusive entertainment booking rights to the arena with the deal. He told the paper that AEG would also book boxing matches and college basketball games, and that the arena could also become home to a minor league basketball team. Smith also said it could land major children’s acts like the Wiggles and Sesame Street. To make room for the new high-profile bookings, some events held in past years could be moved to the adjacent convention center’s ballroom or exhibit halls. 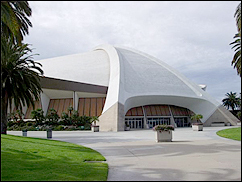 The Anaheim City Council is expected to approve the agreement at a December 20th meeting. The agreement would take effect as soon as the deal is approved. Jim Guerinot, manager of No Doubt, told the paper that the AEG-Anaheim Arena deal filled a gap for bands that were too big to play clubs but not popular enough for nearby 18,000-seat Arrowhead Pond. The Arena, which currently hosts about 220 events per year, expects the added events to bring as much as $1 million annually in increased revenue.